Virtually everyone in New Malden has heard of the Graham Spicer institute and many of us pass it each time we go into Waitrose car park. Have you ever wondered how the Institute came into being, what goes on in the Institute and what it provides to the local community. Graham Spicer was a member of the well-known Spicer family (founders of Spicers paper) of Voewood, Motspur Park. His father was the local Squire of Motspur Park and owned much of it. Graham became concerned about the young men of the area early in the 20th century, as he would regularly see them standing aimlessly at street corners outside public houses. He made friends with a group of them and invited them to see him at a room above the little shop of Tudor Williams in the village on Sunday afternoons. This is how the Young Men's Bible Class and Institute started in 1905. After a few years, Graham rented and eventually bought the old Holy Trinity Church. Membership was based on regular attendance at the Sunday afternoon Bible Class. He built two rooms at the back for members to play Table Tennis and Billiards. They also had Football and Cricket teams. The Graham Spicer Table Tennis Club was founded in 1917. Before the First World War, Graham used to take the boys out on trips, even taking them abroad to France and Belgium. On one journey they lost a boy in Brussels, Joe Hankin missing the voyage home and being left behind. The Belgian police found him and put him on a boat back to England. When the war broke out in 1914 there was hardly a member left in the Institute. Graham wrote personally to every former member serving in the forces, visited their homes for news and went as far as Liverpool to meet leave trains. He even visited hospitals all over the country. He didn't serve himself because, as the story goes, he couldn't use his trigger finger. In 1918, Graham fell a victim to the terrible influenza epidemic and died. His staunch friend Dr Cran took over the Bible Class and named the centre the Graham Spicer Institute. The football team was the pride of Malden and it wasn't unusual for 500 people to watch the team play in Beverley Park, especially in 1921 when they reached the final of the Surrey Junior Cup. Before 1918 Graham Spicer ran the Institute as a hobby, paying for everything. Records from meetings show that his staff brought cakes down from his home to sell in the canteen. Then, in 1922 the Institute was registered as a charity for young men. Once they reached the age of 18 they were expected to leave. In the 1920s the Institute was asked if girls could be admitted but this request was refused by the Trustees and it wasn't until after World War II that it finally happened. 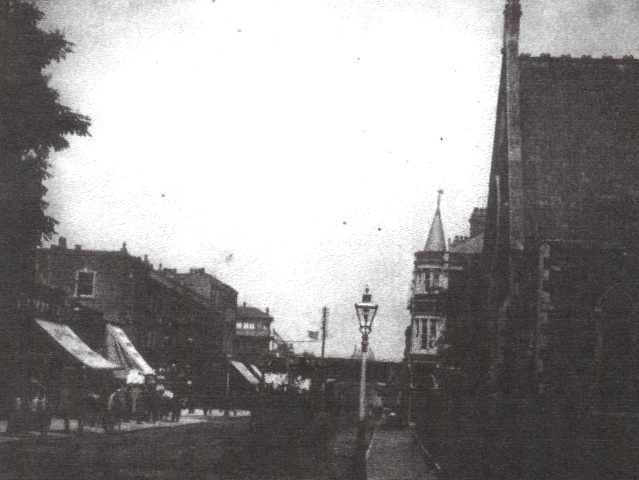 The Old Holy Trinity Church (right of pic) - the original "Institute", this site is now occupied by Waitrose Plc. In 1989 New Malden's Town Hall was no longer used and the educational facilities were moved to the Malden Centre. The Church and buildings had become very run down, so the Institute exchanged freeholds with the council and the land was sold for redevelopment. Waitrose was then built on the original site while the Institute was re-located to the current Dukes Avenue site (next to the Waitrose car park entrance). John Mowat later admitted that the plans for the new building were all developed hastily on a snooker table! As a consequence of the move, there were no more Institute jumble sales: they had been very successful but were no longer viable since the relocation away from the High Street. The Institute concentrated on providing sporting facilities for local people, the premises were hired out for children's parties and at one time, even accommodated a nursery school. Today the Graham Spicer Institute continues to provide a service to the local community from its premises in Dukes Avenue. The ground floor has a purpose built badminton hall which is used by various groups including badminton and exercise groups. The long-running table tennis club, which occupies the entire upstairs hall, has the largest membership in the Thames Valley area. At the rear of the building on the ground floor is a multi-purpose room, which mainly serves two very popular Bridge clubs, WeightWatchers, Slimming World, Pilates, Yoga, Tai Chi and other groups who hold their meetings here. Next to this is a snooker room with a full size table. For more information about clubs running at Graham Spicer Institute and for hire details please contact the office on 020-89422157 between 10:00 and 14:00hrs Monday to Friday.